An Ohio overpass undergoing demolition has collapsed on I-75 killing one person and injuring another near Cincinnati. Cincinnati Police Chief Jeff Blackwell late Monday urged commuters to plan ahead and said drivers should stay away from the collapsed overpass north of downtown Cincinnati and leave with plenty of time to get to work. 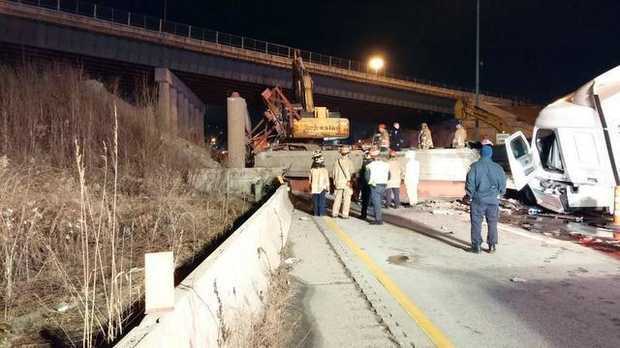 Authorities say a construction worker was killed and a tractor-trailer driver injured when the I-75 overpass collapsed about 10:30 p.m. Monday. The truck driver was taken to the University of Cincinnati Medical Center with minor injuries. The Cincinnati Fire Department said the worker’s body was removed early Tuesday, after airbags were used to lift the wreckage. Jeff Blackwell said the city will work with the Department of Transportation to figure out what happened. He said several hundred tons of concrete had to be removed from the road. The southbound lanes of I-75 would be closed for at least 48 hours, officials said after the accident. The collapse also caused buses that use I-75 and nearby streets to be rerouted.